Dyslexics can be prone to experiencing degrees of Scotopic Sensitivity Syndrome also referred to as Irlen Syndrome. Irlen Syndrome causes visual distortions with text and other written materials on a white background such as white boards, white paper and computer screens. Irlen.com calculates around 44% of dyslexics experience this syndrome from slight to severe. There are however many accommodations to minimize this issue. In this blog I would like to focus on one Irlen Syndrome issue that causes great distress for many sufferers – the difficulty of staring at a computer screen resulting in headaches, sore eyes, and mental/physical exhaustion. And how to use SS overlay programs to alleviate discomfort and exhaustion. First I will explain a little about Irlen Syndrome and its affects. I became aware of this issue back in the 80’s when my dyslexic daughter was telling me letters seemed to be water falling off the page and wouldn’t stay still to read them. I didn’t know what to make of this and at the time I was just beginning to learn what dyslexia was. We did find out she had convergence and tracking issues and after a year of vision training her reading fluency improved but she continued to see “weird things” when she read. Over the years after learning how to manage dyslexia with my daughter and her two brothers, who were also dyslexic, I started to help other parents with their dyslexic children. One thing that came up over and over was the student telling me they saw “weird stuff” on the page when they read. With research I found out about Irlen Syndrome and how it caused distortions when reading on a white background and certain physical ailments when the sufferer was under fluorescent lights, bright sunlight, street lamps and car headlights at night . I decided to become a screener in hopes the accommodations Irlen supports would help the people I work with. Long story short, I have had great success with the Irlen system. So back to SS overlay programs. There are many free programs available now to help change your computer monitor to a color that is soothing for the Irlen sufferer. Each person will have a color or colors they respond to well. 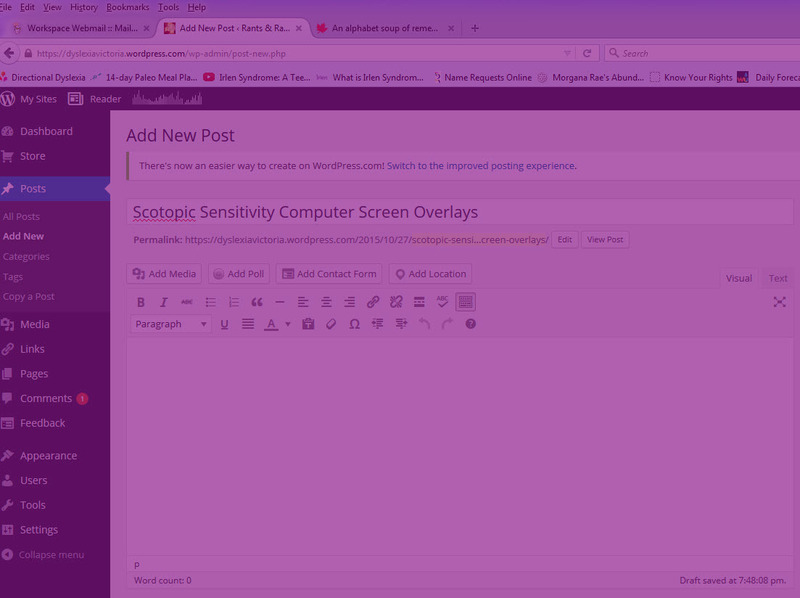 I love this type of a feature because I have Irlen issues and a purple background makes a huge difference for me. The link below is for a pdf link to get the free program called “SS Overlay”. Didn’t find any viruses. This overlay is over the whole screen and you only have a specific number of colors. I like this for my purposes because I can click on links with the color overlay in place where other programs need to move the bar of color aside to click on links. Also you can make the color as dense as you want. When they talk about “Right-click the SSOverlay icon in the system tray and choose “Settings” ” they mean the yellow arrow in the bar at the bottom of your screen. In my screen capture below the arrow is on the far left so you know what it looks like. You can always change your background colors on your computer and internet browser but I find those limiting. There are many other color overlay programs available. If you find a good one, please share. These are very handy tools and can make staring at a computer screen so much more tolerable. The comedian, Gallagher has been around a long time and like George Carlin has been a keen observer of the silliness of our world. In particular, they have had a lot of fun with the English language and its peculiarities. With the language influences of so many groups of peoples who moved in and out of the British Isles over the centuries, the language has become at the very least confusing to a total nightmare for those trying to learn it. This doesn’t include words and expressions that are constantly being added due to new concepts and new stuff we keep creating or discovering. Much of it not conforming to phonics (sounding out a word) or the rules of the English language. One of the qualities of those with a Dyslexic nature is our love of humor. So rather than continue to rant about the English language’s contribution to making a Dyslexic’s school experience hell why don’t you watch Gallagher’s video. He expresses it beautifully. This means I now have to go back and play the message several times to get the name and phone number and some of the message. This drives me crazy. I often don’t get the number right anyway. Here are some suggestions for people leaving messages because you never know if the person writing the message down is numbers and word challenged. When you begin say your name slowly and clearly, who you are with if applicable and your phone number. Say the phone number slowly and clearly and then repeat it. Now the person writing the message will be able to write your information down the first or second time and have a better chance at getting it right. One benefit of this approach is the person writing the information down won’t give up on you and not bother taking your message down because they are tired of replaying your message. If you are talking to someone on the phone giving them information, slow down. Spelling your name out loud slowly is also helpful. Finish by asking if they need anything repeated. People who have difficulty writing things down tend to be embarrassed asking to have it said again. I personally believe most people would appreciate phone messages slowed down. Thank you for listening on behalf of Dyslexics everywhere. Gen, my dyslexic daughter who started my search for answers to understand Dyslexia and how to manage it. When my daughter Genevieve and my other two children were assessed as having Dyslexia back in the 1980’s I began a long journey to find ways to teach them. The school system in California did not have any programs for their learning difference so I had to look else where for ideas. Not much was known about Dyslexia at the time but I was fortunate to meet many interesting people in the San Francisco area who were studying Dyslexia and working with children and adults to help them with their learning problems. We tried all kinds of therapy; some worked, some worked a little and others not so much. One surprising and extremely simple idea was given to me by a teacher from a school called New Horizon School and Learning Center in Santa Rosa, northern California for kids with learning disabilities. I had heard good things about them so I gave them a call. The person I spoke to suggested I bring my daughter in and they would see what they could do to help her (New Horizon provided assistance that provided insight to help me understand my daughter and taught me how to teach her successfully!). One idea she told me over the phone along with some tweaks of my own over the years became one of my best tools working with Dyslexic children. Gen, a fifth grader at the time, was a very poor speller. The lady from the school suggested trying an experiment to show Gen a different way to remember spelling words. She told me to get a yellow piece of paper and print a word on it in large thick letters in felt pen she didn’t know how to spell. Then she told me to have Gen sit looking straight ahead and hold the yellow paper with the printed word up and to the left of her head. Then as she is staring forward she moves her eyes up to the piece of paper. As she is looking at the yellow paper with her body and head sitting straight and eyes up and to the left she looks at the word, says it, and then reads the letters out loud right to left and then left to right (frontwards and backwards). Gen repeats this process 3 times. Then closes her eyes, imagines the yellow paper and word printed on it. She says the word aloud again and says the letters she sees in her mind frontwards and then— backwards! I kind of scoffed at this but I thought worth a try. I had tried a lot crazier things with my kids. I decided to pick a long multi-syllabic word because of course I didn’t believe it could work. I put Gen through the process that had been described to me and she did it – frontwards and backwards – easily. There is extensive research on eye movement and what it means as far as memories and imagining things. However I haven’t found any conclusive evidence on what eye movement means but lots of speculation such as this article: http://www.livescience.com/1473-moving-eyes-improves-memory-study-suggests.html. The lady I talked to from the school said memory could be aided by looking up to the left. This was back in the 80’s and I don’t know if this is true but what I learned, in my opinion, it is important to have Dyslexics visualize something as a picture with parts in order to retain it. So a word is a complete picture with parts (the letters). The colored paper helps them create an image of the word in their mind by providing a background and the colour helps the word stand out. I describe my method in one of our manuals called “14 Steps to Teach Dyslexics how to Spell and Read”. All the Dyslexic children I have worked with have been able to visualize words this way. The image here of the word “dog” on the blue paper is how we create flash cards for “boxing”. This type of practice will help a Dyslexic visualize words in their minds so they can start to retain them. The 14 Steps has 13 other practice methods to help Dyslexics improve their spelling and reading fluency. We are often asked for suggestions to help adult Dyslexics improve their writing skills such as spelling, grammar and organization of ideas. There are lots of helpful methods and accommodations. Here are a few ideas. For Dyslexics it is often important to see examples and reasons for learning any new information or skills rather than just following step by step instructions. Technical writing is geared for occupations such as online help, user guides/manuals, white papers, design specifications, system manuals, project plans, test plans. This type of writing is a great place for a Dyslexic to learn grammar and structure in writing because the style is very specific, concise and not “flowery”. College level technical writing courses are a good resource for learning this writing style. I would suggest taking a least two or more of these courses to work towards proficiency in this writing technique. Creative writers will take repeat courses in creative writing to practice, be critiqued and develop good writing skills to improve their stories or poetry. Dyslexics can also take online courses but I think the classroom can be very beneficial for feedback and hands on attention which is important to Dyslexics. Because technical writing is for documenting information and instructions it can also be good practice for a Dyslexic learning to create a sequence of steps leading to a conclusion which is very difficult for many “big picture to details” Dyslexics. Before taking the course try to find a teacher who is a “big picture” thinker. Interview them or talk to other students who have taken their courses. Questions to ask: Does the professor use “mindmaps” to lay out lessons, favour explaining the “whys, whats and how”, gives lots of examples of the writing assignments, and uses big picture teaching methods. REMEMBER: if they teach in a step by step sequential manner a Dyslexic will often be lost and frustrated. If a Dyslexic takes one course they might have found it somewhat or very confusing – unless they get a very right-brain thinking teacher who thinks like them. They shouldn’t give up. The first course will help with the big picture of the technical writing style and the next and maybe third course will probably work well for the Dyslexic student wanting to learn how to write well. I realize this is a lot of dedication and most people probably don’t want to do more school but it will help tremendously. Dragon Naturally Speaking is speech recognition software. You speak, it records and prints the text on your computer screen. This program helps a Dyslexic turn their thoughts into text. Often Dyslexics are very articulate but cannot write because they lose their ideas in the effort of trying to remember proper spelling and employing the physical action of handwriting or typing. One thing to remember – part of the process with speech recognition software is training it to a person’s voice. This is done by using a head set with mic and reading a passage out loud that the software provides in the program. There are a number of reading choices. The problem with this method is Dyslexics have difficulty reading aloud so the program will not train properly to their voice. The program cannot recognize their words when the Dyslexic reader hesitates, mispronounces or says the wrong word. The answer is to download and print the reading sample they chose. Make sure to increase the size of the font and double space it. Then practice reading it in a normal voice until they are not hesitating or mispronouncing words. I wish I had a quarter for every parent of a Dyslexic student or adult Dyslexic who told me the program doesn’t work for them and gave up on it. They don’t realize the need to practice saying the passage aloud so the program gets a clear impression of their voice. If you have something to share that you have found works for Dyslexics improving their spelling, grammar and writing I hope you will add it the comment section. This is a short thought for the day. When I am working with Dyslexic students they generally have issues with self-esteem. A large component of their poor self image is the belief that everything they do is wrong. One of the first things I chat about with them is there are no mistakes, only practice. When we are learning, part of the process is practicing what we are studying so we can understand and do well with the subject. This applies to many areas of life such as school, sports, hobbies, skills or a profession. People who become great at what they do know the importance of practice. In school the focus is often on failure (worksheets, assignments and tests) and not on the value of practice. When I was in the University of Victoria in the Education faculty back in the 70’s I had an amazing professor, Chuck Galloway who taught child psychology. He believed passionately in the value of practice. He taught us that children learn well when their classroom environment promotes understanding what they are learning, not punishing them for what they haven’t sorted out yet. He used us as guinea pigs to demonstrate this. We were encouraged to hand our work in, have it reviewed and given suggestions to improve it. We could take that as far we wanted for a final grade and we were coached to ask for assistance with what we were not understanding. Stress was low replaced with excitement and curiosity for the very difficult subject of child psychology. Dyslexics have so much stress in school due to their learning issues which attracts bullying from their classmates and frustration from their teachers and parents. If their feelings of failure connected to getting everything wrong and making mistakes are not addressed and not employing appropriate teaching methods, clear specific instructions and accommodations for their learning differences, they will begin to shut down to most learning. They start to believe they can’t do anything right, only make “mistakes”. So for Dyslexics and all students, focus on practice. When they say “Did I do it wrong?” tell them no, they are only practicing to get it right. Then go through their work to find out what they don’t understand. If they know they need more explanation and practice to understand their school work to “get it right” and you are there to help them, they will begin to open up and maybe even start to like school.